The caterpillar is heading stage left, eyespot on the other end, an intended distraction. As if I knew this beauty–or even did the work to key it out for myself. I’d never seen it, and failing in a five-minute scroll of Google and Bing images of North American caterpillars, I resorted to a kind of benign cheating. I posted the image to the Caterpillar Identification group on FB at 4:20 this morning and less than an hour later, had a correct ID. Many thanks! Both the caterpillar and the adult moth are quite variable. I HAVE seen the moth but did not know what it was. I will next time–my world richer for knowing one more living thing and fellow creature, by name. 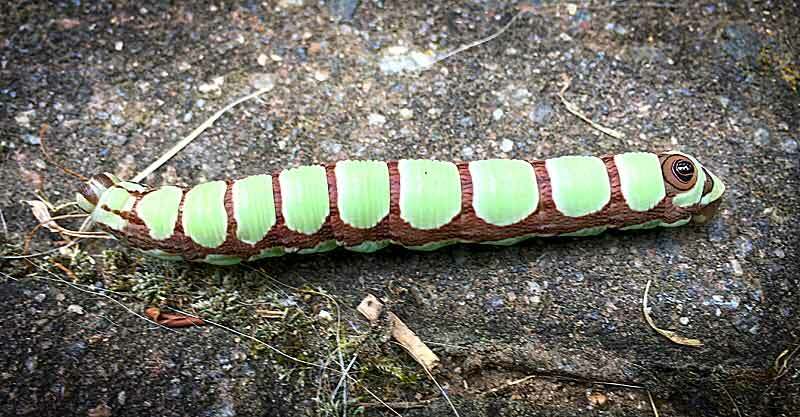 Abbott’s Sphinx Caterpillar – What’s That Bug?